Acting Ukrainian President and Verkhovna Rada Chairman Oleksandr Turchynov has assumed the duties of the supreme commander-in-chief of the Ukrainian Armed Forces. A respective decree of February 26 has been published on the Web site of the acting head of state. "In accordance with Paragraph 17, Part 1, Article 106 and Article 112 of the Constitution of Ukraine I assume from this day the duties of the supreme commander-in-chief of the Armed Forces of Ukraine," reads the decree. On February 22, the Ukrainian parliament adopted a decree on the dismissal of President Viktor Yanukovych from the fulfillment of his constitutional duties and scheduled early presidential elections for May 25, 2014. In accordance with the Constitution of Ukraine, which took effect on February 23, the presidential duties are fulfilled by the parliament speaker in the absence of the president. 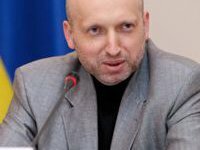 On February 25, the president gave Ukrainian Parliament Speaker and acting president of Ukraine Oleksandr Turchynov the powers to sign laws adopted from February 21 until the election of a new president.